For many, above all, family is the most important thing in someone’s life. There is the biological family and then there are those people who are close enough friends to be considered family. The motocross community is viewed by many to be that type of family. We are a tight-knit group of people always ready to reach out and help one of our own. At no time is this more evident than when a sudden death takes one of our family. 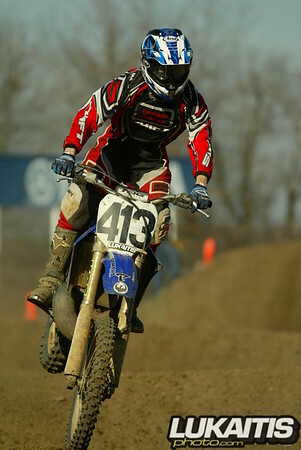 On March 17th the motocross community lost a great man, Richard Zupko Sr. passed away. Mr. Zupko died suddenly of a heart attack to the shock of his family and friends. Mr. Zupko was a great supporter of motocross racing in New Jersey and along with his son Richie, they ran Powerline Motocross Park back in the 90’s. He was always there with a smile and a kind word, Mr. Zupko will be greatly missed. When it came time to pay respect to a lost friend the line stretched out of the funeral parlor and around the block with many waiting for several hours to get in and say their final goodbye. His son Richie has been a successful racer during his motocross career but the most emotional win of his life came on Sunday, March 25th. It came in 30+ Expert class racing. The first moto saw Richie fighting a great battle dicing with Kawasaki rider Darren Edsall and Honda pilot Jerry Seip. He would eventually settle into the lead and go on to take the victory. During half-time in between motos, the Raceway Park family took the opportunity to say goodbye to Mr. Zupko. A lap of honor took place in which all the riders and staff lined up on the starting gate and rode around the track single file. Each rider paid a $10 entry fee with all of the money going to the American Heart Association in Mr. Zupko’s name. At one point the line stretched almost all the way around the racetrack. It was a fitting way to say goodbye. When Richie took the holeshot at the start of the second 30+ Expert moto everyone knew it would be his for the taking. Despite attempts by Seip and Edsall to keep him in sight the moto and overall win would be Richie’s. With family and close friends nearby celebrating his victory Richie was clearly emotional winning that one for his dad.